Who doesn’t like to get acknowledged for all the accomplishments? Everyone loves it. People think that it is easy and simple to accept a compliment where someone says something nice, you say thank you and this is it. But the reality is that people often struggle with the words and situations while accepting the compliments gracefully. We actually end up explaining to people that there is more room to the work that is yet to be done or we start suggesting the names of other people for sharing the credit. It is just because we avoid looking like a self-promoted person and downplay our work. You just have to STOP giving these reactions. It is really important to know how to say thanks for the compliments. So, if you think you want to learn, then read on further. A few years back, when people use to give me compliments, I always tried dismissing my worth and my abilities, but one of my friends pointed out by negating his compliments. He said that my response was not good at all. And this was the moment when I realized that I had to change my way to respond to the compliments. I learned that when someone gives you a compliment, let him/her give credits to your accomplishments. People are usually honest while appreciating because they notice you. So, whenever you receive a compliment, just believe in those words and take it gracefully for the work you did. I can say that you can take a compliment with a verbal pat on the back. You are actually receiving an honor which you deserve and the person appreciating you have acknowledged you because you did a good job. But harder part is how to say thanks for the compliments? It is difficult to learn what exactly we have to say. And you will feel great to know that years down the lane, I have found the easiest and the simplest approach that is a “simple thank you with a smile.” You are free to elaborate your feelings and can share the credit with other people as well, but avoid resisting downplaying the compliments. So, if you are a loss for words while responding to the compliments, then you can try these responses. I did what I thought you are looking for and thank you so much for appraising. I am glad that you liked it. Thanks a lot for appreciating. I really enjoyed. Thanks for noticing it too closely. Glad to know that my work is worth to be acknowledged. It is you who worked hard, and then there isn’t any need to dismiss those compliments. You actually deserve them. Plus, if you will learn about how to say thanks for the compliments, then you will get a chance to see your worth the same as other people can see in you. Isn’t that amazing? Compliments express admiration, respect, and approval from a person from whom you did something good. Every individual highly appreciate the compliments which they receive because the compliments boost our confidence. It is one of the ways to tempt people at particular situations which they will never forget. It even helps people in maintaining a decent relationship with each other. And even helps in making our future better. It feels really nice while receiving compliments, but as I already told you that it is difficult to learn how to say thanks for the compliments. The standard responses include a simple Thank You. But, yes, it is you who can show your magic through the words. You can make the person surprise by saying that you weren’t expecting their compliment. You can even give credit to other people or you can give them a compliment in return. You can say a simple thank with a ‘but’. Remember to use ‘but’ after your simple Thank You only when you are sure with your words. Do not downgrade your quality by giving a lame response to the compliments you receive. Like, If someone praises your handbag, then avoid jumping off from your seat and letting them know how old it is. Avoid showing people that you are not capable of keeping yourself updated with the trends. Asking a question to the person who gave you a compliment is one of the practical ways to say thanks. So, when someone appreciates you and give you a compliment for the work you did, then you can think over a little too elaborate it. This is something valuable for your future achievements as well. A simple thank you for a compliment is a polite way, but it is tactful to play with your words while adding few flattery words following your thanks. YES. It will help you in having a decent conversation with the person. I was captivated when I received your compliment note and was manifested pleasure reading your beautiful words about me and my family. Your words really made me happy that now you are wholly comfortable with me and my family. I would like to tell you that we already miss you a lot and really enjoyed being with you. You are always welcome to stay with us anytime in future. I would like you to know that I was pleased when I received your beautiful and kind note of encouragement and support. Thank you for supporting me all through the ups and downs. Whether you are being so far from us, still you inspire me to work hard and achieve my goals. Please accept my sincere thanks and hope to get full support in my future endeavours. I truly appreciate your kind words for my efforts for the presentation today. I really need your support for further endeavours and would love to work with you as a team. Thank you again. Thank you so much for your encouraging words and for being a good reader. I am pleased that you really enjoyed reading my articles. I am blandished knowing that my column brightens your day and its worth your appreciation. 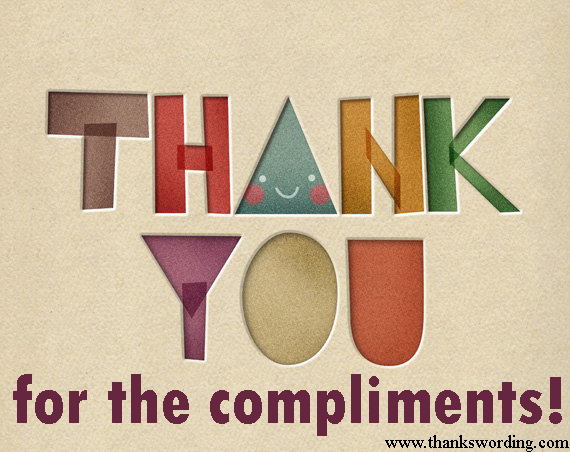 It is really important to learn how to say thanks for the compliments if you really want them coming your way. And yes, while responding to the compliments, it is must sound that you really mean it. Avoid responding in lone voice and just show your modesty. Just be brief and short while giving a compliment in return. So, stop undervaluing yourself and start accepting compliments with grace. And don’t forget to respond with your modest, Thanks.